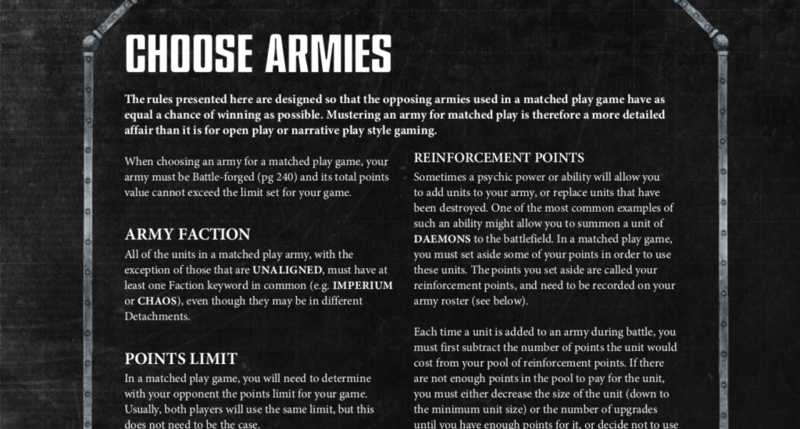 Earlier I wrote a quick walkthrough about army list selection in Warhammer 40,000 8th edition. 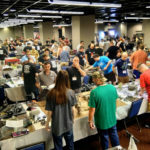 Unfortunately, aspects of those rules demonstrate again that 8th edition is very good, but neither as slimmed down nor formal and clean as it has been hyped to be. 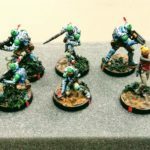 The issues crop up from the new incarnation of Objective Secured, which enables models selected as part of an army detachment with uniform faction to trump other models for control of objective markers. To begin, there isn’t really a rule for Objective Secured. There’s a rule for Objective Secured, Defenders of Humanity, Knights of Titan, and so on. All the different codexes are coming out with the same rule under different names, e.g., the Space Marines’ Defenders of Humanity. 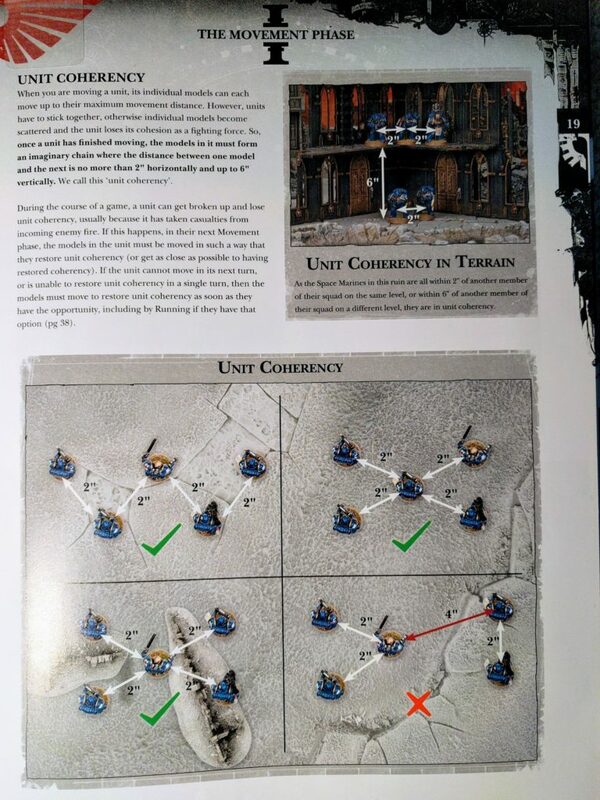 Meanwhile, to maintain some parity for the factions that don’t have a codex yet, GW previewed an Objective Secured rule to be included in the upcoming Chapter Approved supplement giving that ability to all of those armies. This copying & pasting is strange and unfortunate. Defenders of Humanity made sense at first when the ability was initially presented to be a unique Space Marines advantage. The presumption was other codexes would then arrive with different but similar abilities. But it turned out they all just have the same ability. Note that the abilty per se isn’t the problem. Diversity of abilities would be interesting, but also harder to balance. It’s the presentation of this universal ability that is problematic. 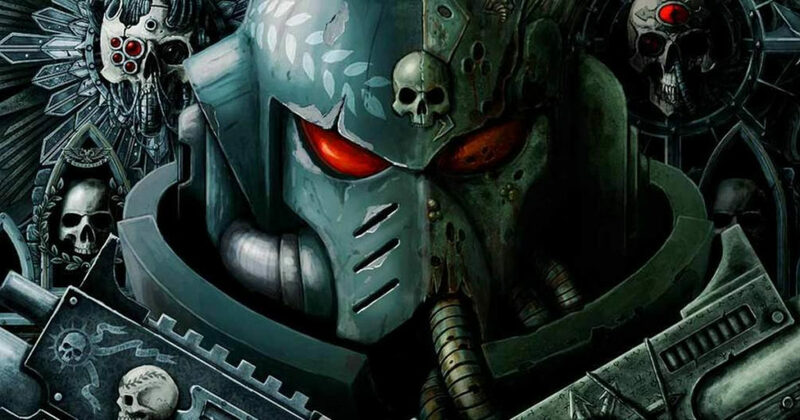 Even minor carve outs such as for Fabius Bile and Fallen being compatible with all the legions and thus not breaking the faction uniformity of Chaos Space Marine detachments don’t merit copy & pasting the entirety of the basic idea into each book. Models with Objective Secured trump models without Objective Secured for control of objective markers. Instead the new rules have to be worded in terms of trumping models with “a similar ability” because they all have different names. What does “similar” mean? In practice it’s understandable, but it’s not as formal as it could be. 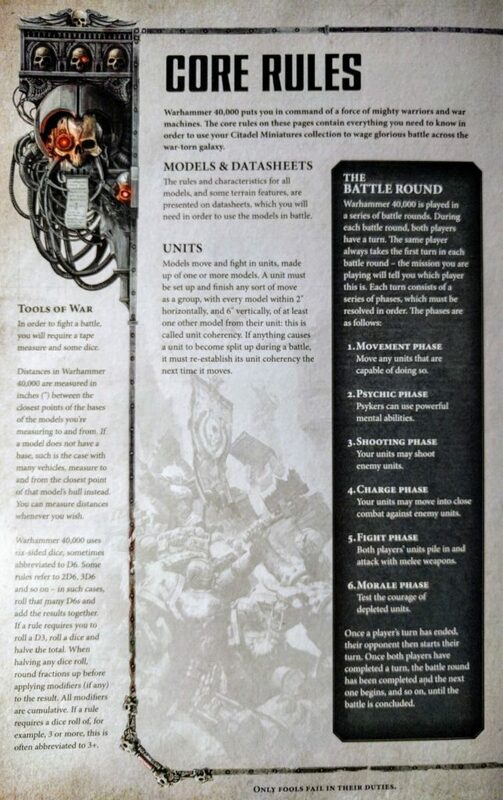 All this duplication under different names is unfortunate but a hallmark of this edition, a consequence of “streamlining” the game by eliminating common text from the core rules and main rulebook and instead pushing it out to numerous copies in the codexes and datasheets. If all the factions are going to have this rule, there should just be one straightforward universal rule. That centralization would reduce the overall volume of rules and text, foster understanding, be more formal, and prevent errors from creeping in over time with successive copying. This is also another example of how GW went to all the trouble of introducing a keyword system, but isn’t actually using it well. Objective Secured could easily be handled more elegantly and formally by granting units keywords if their detachments meet given conditions and wording the ability around those keywords. More critically, these rules contain ambiguities in their prerequisites. For example, Defenders of Humanity relies on the definition of a “Space Marine Detachment.” The other books are structured similarly. As explained below, that definition isn’t 100% unambiguous on whether or not a Space Marine Detachment can include multiple chapters within the codex, e.g., Salamanders and Ultramarines. It is explicit that Space Wolves and the other variant codexes are not included. Beyond Defenders of Humanity, this ambiguity also raises rules questions about stratagems. 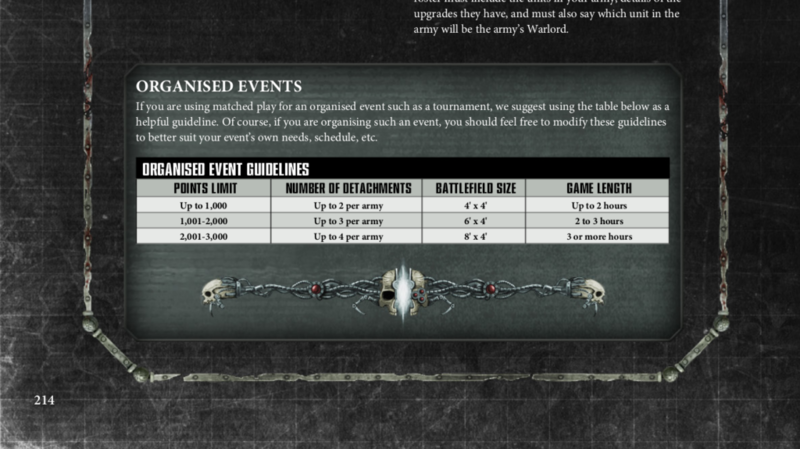 Those listed in the codex are unlocked if you field a Space Marine Detachment. So must you field a detachment drawn from a single chapter to get access? Or would a detachment comprised of any mix of Space Marines suffice? A Space Marine Detachment is therefore one which only includes units with one of those keywords. … [units with one of those keywords]. The wording doesn’t actually make a binding to a single chapter keyword across the whole detachment, it permits a selection per unit. 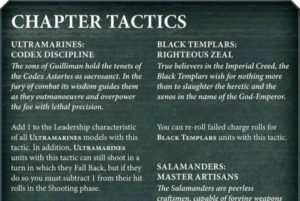 A detachment made up of Salamanders and Ultramarines would indeed quite obviously “only include units with one of those keywords.” Note that units can each only have one of the keywords in the given list, so “one” doesn’t instate any additional information as compared to, e.g., “any,” and is a more natural wording anyway for a selection of that type. So in that straightforward reading, a detachment of mixed chapters would receive the benefit of Defenders of Humanity. A Space Marine Detachment is therefore one which only includes … one of those keywords. In that case a Space Marine Detachment may only be comprised of “one of those keywords” and mixed chapters won’t receive the benefit of Defenders of Humanity. A Space Marine Detachment is therefore one which only includes units with one of those keywords, which must be the same for each unit. 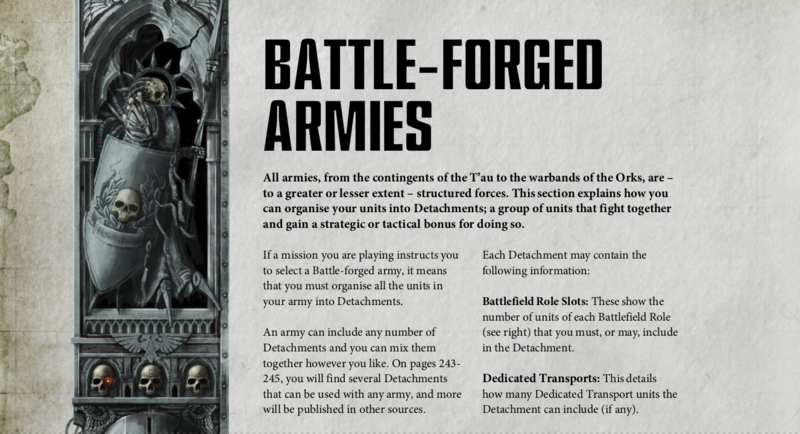 A Space Marine Detachment is a detachment comprised solely of Adeptus Astartes units, all with the same <Chapter> faction keyword. In trying to resolve that ambiguity, the intent is impossible to decipher from the text alone. Certainly it would be most traditional for a “Space Marine Detachment” to be comprised of a single chapter. However, it would also be quite reasonable and not at all out of line for Defenders of Humanity to apply to any mix of Space Marines. 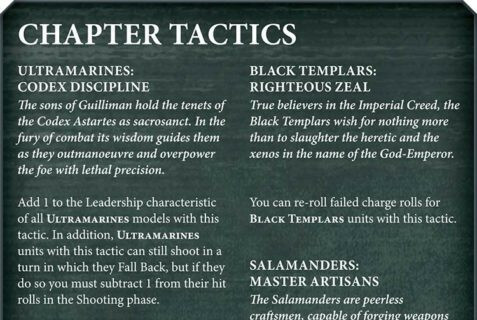 Chapter Tactics, which is explicit about being available only to uniform detachments, would then be an extra benefit for selecting units entirely from one chapter and strongly encourage that traditional makeup. The latter would be a more interesting structure and create somewhat more list building decisions, so it could easily be the intent. In practice this ambiguity doesn’t matter much. The benefits of Chapter Tactics are so considerable and the ability to mix factions between detachments so flexible that there’s little reason to not field single chapter detachments. In theory though you might, e.g., if a future codex had weaker Chapter Tactics equivalents but strong characters from different chapter equivalents that you wanted to combine in one detachment but still be Objective Secured. 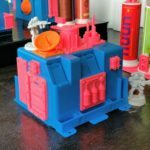 As with the previous examples of textual (as opposed to mechanical) shortcomings in 8th edition’s rules, right now these generally aren’t actual problems due to the freshness of the duplicative copies and the competing interpretations of the ambiguity being obscured by the in-game strength of one. But they create openings for problems, particularly as the game evolves. With each new book there’s a chance to introduce a real error while pasting in its copy of Objective Secured. At some point there might be a real reason to field a detachment of mixed chapters/legions/dynastics/etc. and face real questions about what buffs it would receive. The elimination of Universal Special Rules and other centralized concepts no doubt minimized the number of pages in the main rulebook. But it necessarily expanded the cloud of text replicated throughout all the books, with identical rules under formally and often even textually different symbols. Objective Secured and all its variants such as Defenders of Humanity are a prime example. That unnecessary inelegance and volume of text is unfortunate, a product of over-minimizing and false simplification. The ambiguity in defining Space Marine Detachments isn’t hard to see and the definition trivial to improve. 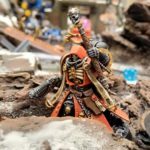 So it highlights that although much improved, Games Workshop’s ongoing reviews of 40k material are still very limited and non-technical. The playtest group is still too small, coming in with too many shared assumptions, not analyzing the language or mechanics formally enough, and sharing too much extra-textual context and intent to catch all possible interpretations and other potential issues. It is a much longer discussion for another day, but for a such a complex technical system (the game) and with such a large, diverse, and disconnected audience implementing that system (players worldwide), large scale public review is strongly warranted. That could be done in an efficient fashion to minimize burden on GW’s end, and, as other games as well as GW’s own recent public rules releases (for both 40k and Age of Sigmar) have demonstrated, in such a fashion that it wouldn’t hurt sales. Continue to expand the scope, diversity, and extent of peer and public review. 40k 8th edition is very good. But it could be even better with minimal effort and cost.